Montreal is a wonderfully liveable city in the summer months, the area where we were staying, especially so. 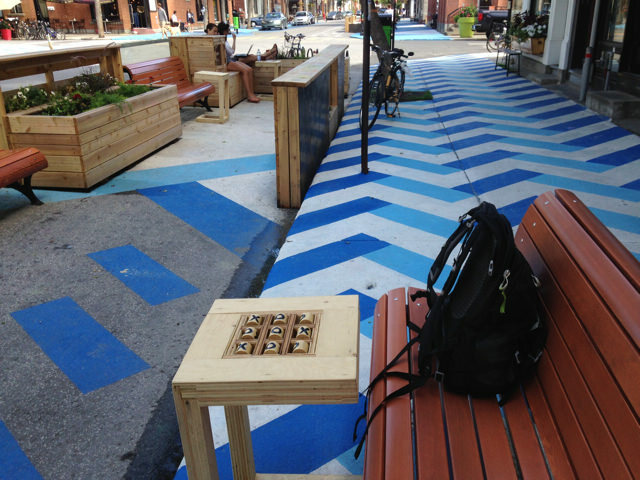 This is the Jean Talon neighbourhood and there are several areas in the streets like this one below to sit and visit or play a game of x’s and o’s! I sat on this bench to do two sketches. 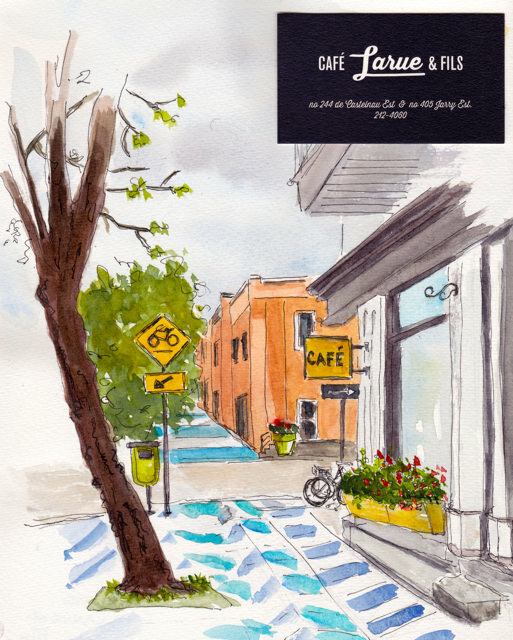 The first sketch looks east to the corner where the very friendly Café Larue sits. 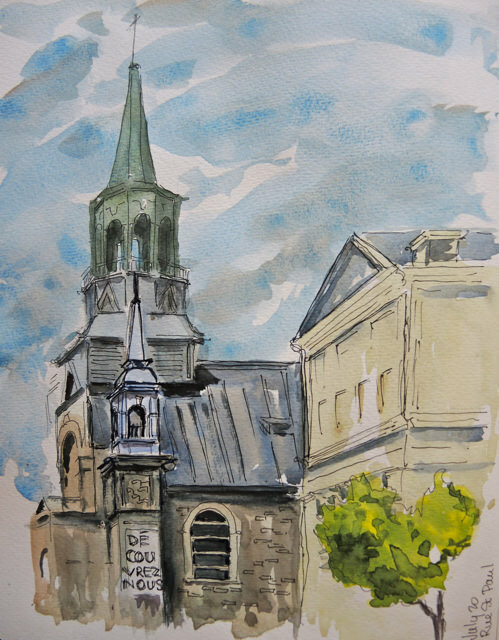 The second looks across the road to the Church of Ste.-Cécile–since I was looking up, up into the sun, I only managed to sketch one of the two spires. 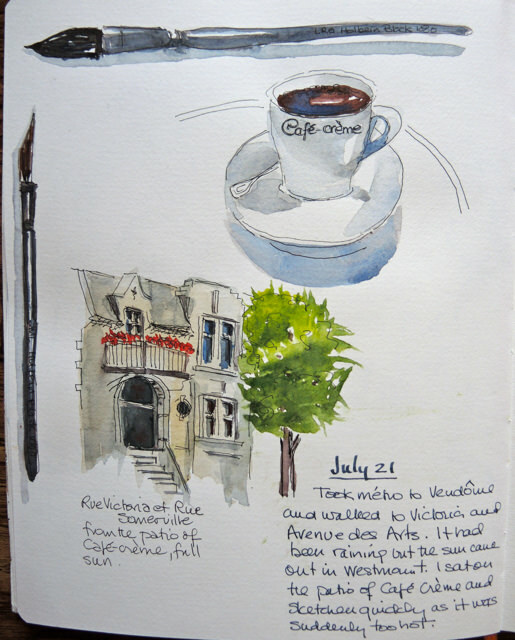 We were only in Montreal for 3 1/2 days and there was so much more to sketch even in this neighbourhood alone. 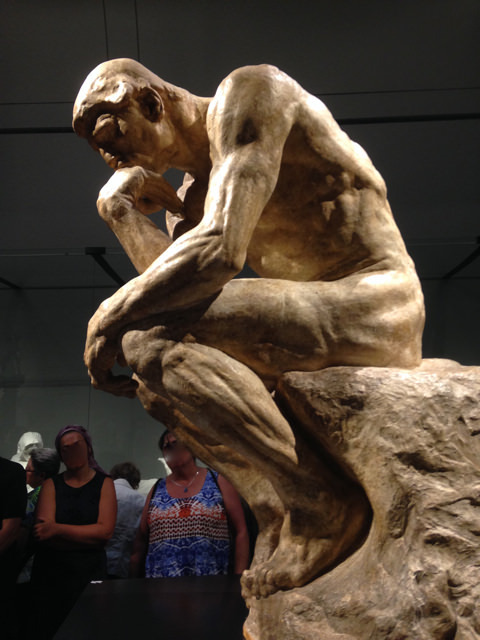 But I had to stop as we didn’t want to miss the Rodin exhibit at the Musée des Beaux Arts. 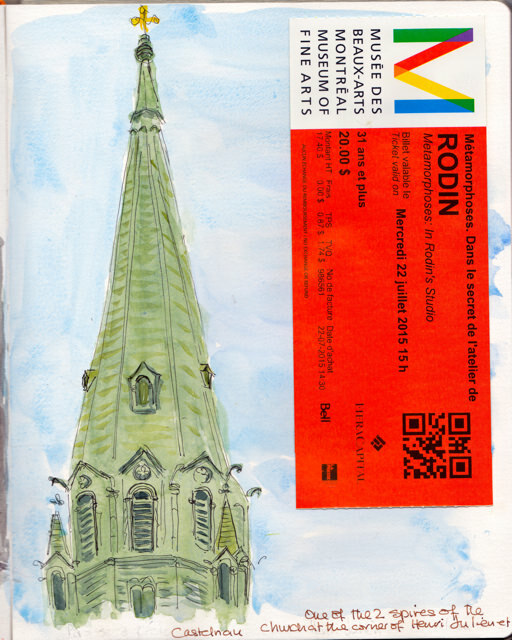 We took the subway to McGill University and walked along Sherbrooke to the gallery. 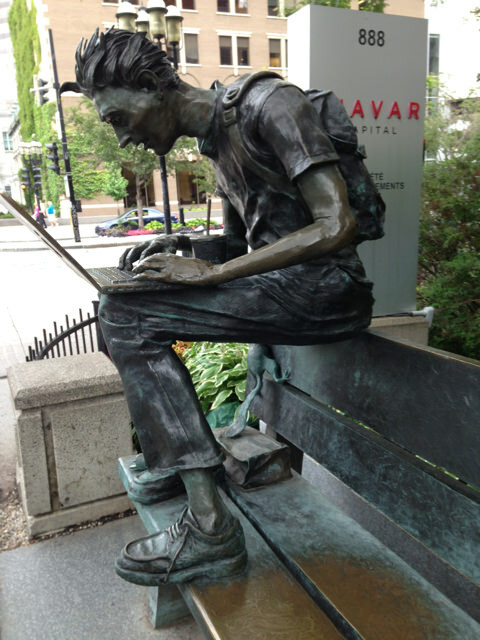 On our way we were charmed by this delightful sculpture done in 2012 by Cédric Loth. You can barely see it in this photo–look under his leg– but he is so intent on his computer, trademarked with a pear (!) that he doesn’t notice a squirrel eating his bag lunch. We carried on along Sherbrooke and spent the afternoon with Rodin. His massive Thinker makes an interesting counterpoint to Loth’s student. 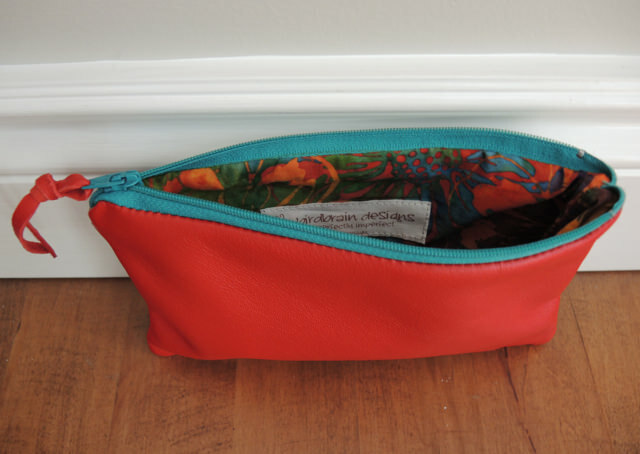 Today I took a trip to Westmount to one of my favourite art stores, Avenue des Arts. I treated myself to two new brushes, both Holbein. The one of the left is a scroggy and lots of fun for foliage. I tried it out immediately at a café patio just across the street. It had been raining in the morning but the sun came out full blast while I was doing this sketch. 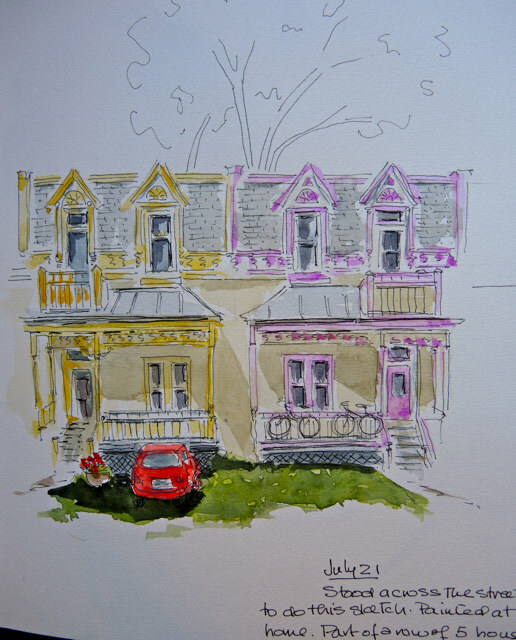 The sketch below that one was done while standing across the street, also Rue Victoria, from these quirky charming row house–five in all, I think. I did the ink on site and then finished the painting later. I love the Westmount area with its early 20th century homes with their distinctly quebecois architecture. 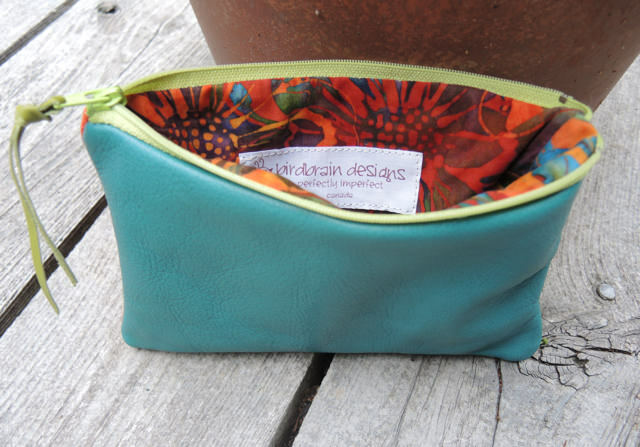 And everything is so green this summer in central Canada–we are very lucky. We are in Montreal for a few days. Our son is away cycling and he left us the keys to his apartment. It’s in a great neighbourhood and I hope to sketch some of it tomorrow. 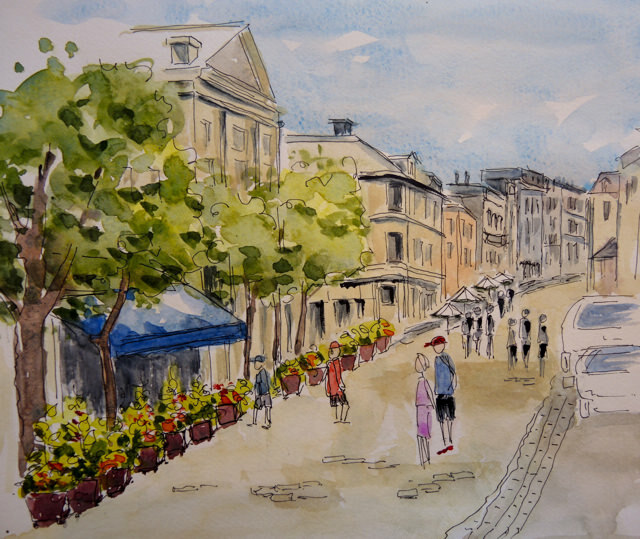 But on our first day we headed to the Old Port and I sat on my stool on Rue St. Paul and did a sketch facing each way. I finished the ink on site and then added the paint once I got back to the house. I’m still working on foliage and, of course, perspective. 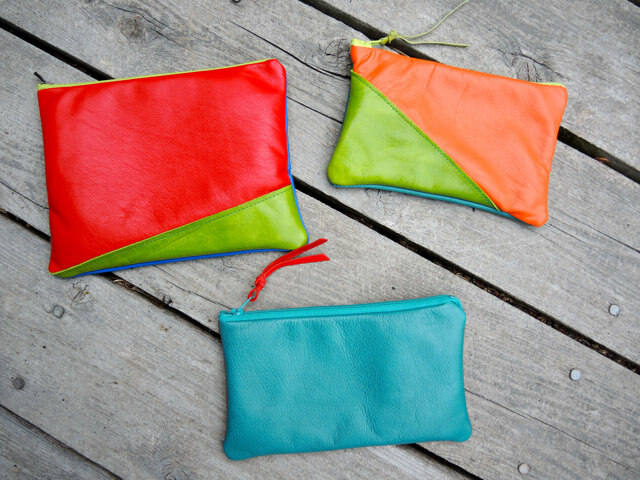 But here they are. 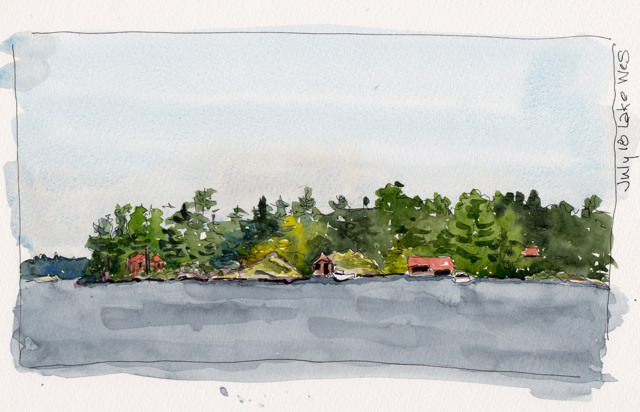 Today I sat on the dock with my paints and sketched the island across from ours. I took an excellent class with Shari Blaukopf in June at Montebello Quebec and since then I’ve been working on foliage. Here I’ve tried to do the whole thing in one wash, varying the colour as I went across and then coming in later with darks. The lake provides lots of opportunity for practice at foliage. As well, the big expanses of sky and water make for more challenges. But with the rest of the summer ahead, I’m going to head out in the little boat with the anchor and see what I can find.